Starting today commit to giving your absolute best to every task which comes your way. Rather than seeing things as a burden or menial tasks remind yourself that each is preparing you for the eventual larger opportunities which lay in store for you. To paraphrase business philosopher, author, and lecturer Jim Rohn, you can’t just start at the top, it’s as though life is making sure you can handle the smaller tasks that are required of you, before you’re given the responsibility of having to deal with the bigger ones. Prove you can work through the smaller things that are asked of you and before you know it, you’ll attract greater opportunity, along with the greater life rewards that come with being able to work through them. 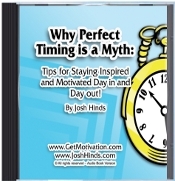 * Josh is the author of Why Perfect Timing is a Myth: Tips for Staying Inspired and Motivated Day in and Day out! and It’s Your Life, LIVE BIG!